The Instituto de Sistemas Fotovoltaicos de Concentración (ISFOC) is the worldwide institution owning the greatest number of CPV installed plants, which feed the beggest total power in world. ISFOC CPV plants are all sited in Castile-La Mancha (Spain). From September 2008, ISFOC operates and analyses two CPV plants of 300kw and 800kw each, installed at Almoguera (Guadalajara- Spain) and Puertollano (Ciudad Real- Spain). In those plants, three different technologies are operating: Isofotón (company located at Málaga -Spain); Concentrix Solar (German Company with a subsidiary in Seville -Spain) and Solfocus (USA). Their infraestructures were developed during ISFOC first stage os constitution. Additionally, works and documentation for another CPV plant of 1600kw to be located in Puertollano are being completed as well. 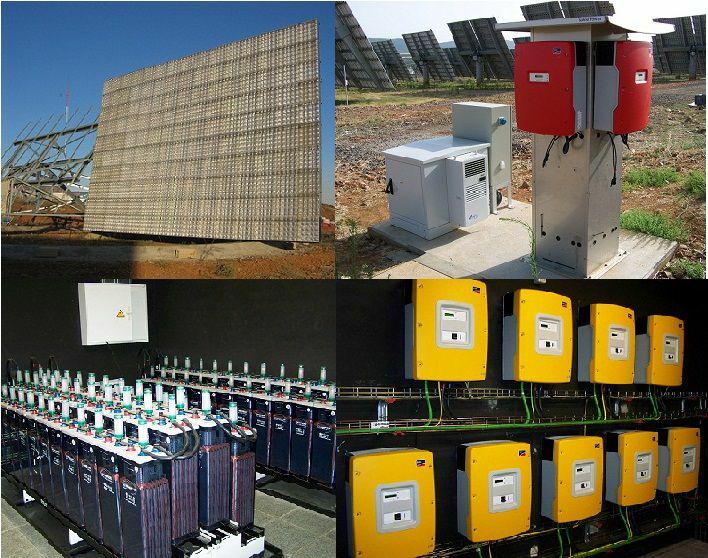 Its start-up is foreseen for 2012, being implied five different tecnologies: Concentrix Solar (Germany), ArimaEco (Taiwan), Sol3G (Catalonia-Spain), Emcore (USA) and Renovalia CPV (Castile- La Mancha- Spain). That is the last ISFOC installation, closing up its development and investment stage on CPV. ISFOC, whose aim is to increase the energy efficiency of its installations, has developed a hybrid system for auto consumption that translates into important reductions on its building air-con system grid-demands. This system uses a CPV installation of 22.5kWp, battery-lines of 110kWh and the grid as support, in order to manage, through grid conductors of 45kW, those different enrgy fluxes while benefiting to the maximum form the solar resource. Therefor, in case of an energy surplus due to a high solar irradiation and to a low consumption, grid-conductors charge the batteries. If the batteries are already charged and the consumption is low, the CPV installation production is cut back. On the other hand, if there is no enough energy due to few or null solar irradiation while there is a high consumption, it supplies the energy surplus through the batteries. If the batteries are running low or if there is a high consumption while there is no enough solar irradiation, the grid-conductors are able to feed directly to the grid, granting that way the supply in every moment. The system is completely monitored as to be useful for the development of the CPV system on this kind of applications. Likewise, thanks to its modular structure, it will allow to add new other components in the future.